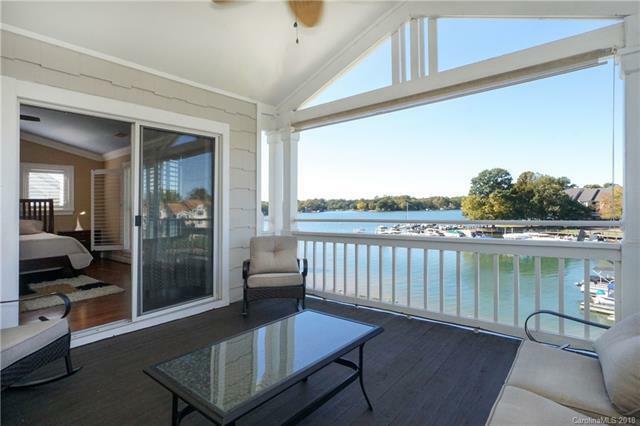 If you are in search of a beautiful, designer-inspired, "fully-furnished" 3 BR Penthouse please take a peek at this completely renovated home in the Newport section of Davidson Landing. This quiet & private location with fabulous waterfront views is absolutely gorgeous. The like new interior includes a marble foyer, hardwood floors throughout, tiled bathrooms, custom cabinetry & interior doors, entertainment bar with wine storage, lighting and fixtures, striking gas log fireplace with mantel & marble surround, granite countertops throughout and huge breakfast bar. Discerning clientele will also appreciate having plantation shutters throughout, custom mill work, a Master Bath w/raised granite counter tops, two sinks & vanity, stunning tiled walk-in shower, custom finished master closet and spacious secondary BRs. The HVAC & water heater are 6 years old. You will enjoy dining at our North Harbor Club or the many wonderful eating establishments of nearby historic Main Street in Davidson.